Anyway, for the first time in several months, I made a detour on my way to work and emptied the damn thing out. I was running a tad late, so didn’t check the contents there and then. A while later, when I arrived at the office, I then quickly filtered through what I’d obtained. There was the usual junk mail and bills pointlessly sent by various companies (who e-mail their bills to me anyway, and my efforts to educate them about the wastage thereof have so far been futile). But that wasn’t all. There was also a traffic fine. Someone else’s traffic fine. Approximately two months old. And sent all the way from Beaufort West. Which the Post Office had, in all their infinite wisdom, placed in the wrong PO Box. My one. To the intended recipient of said traffic fine: I’m so, so sorry. I’ll make sure it ends up your PO Box on my way home this afternoon. Comments Off on How hard can it be? … trying to get from Upper Woodstock to Parklands in good time before the afternoon peak? Well, if the N1 outbound is closed due to a freak truck accident, very hard. Instead of cruising up the R27, which should have taken me around 30 minutes, I ended up having to take a rather convoluted route home to avoid the resulting city-wide traffic jam. Made it home in 90 minutes though. Of course, it happens on a day that I didn’t ride the bus in to work. Just lovely. … is that the extremely strong bond between all 10 of us is based solely on inappropriate activities that no sane person should have. Ever. We’re on our usual milo break, standing in front of the eyeball, when Mr Smartypants (That’s Cataplexy) decides he wants to kill a rogue. He lifegrips Gatstamper to in front of the boss, runs off giggling and mind sears him from a distance. and a totally oblivious rogue. I look forward to the retaliation. Stay tuned for the next installment. Which will probably be after Thursday night’s raid. A Russian Proton rocket went out of control and slammed into the steppes of Kazakhstan mere moments after launching from the Baikonur Cosmodrome on Monday night. The government booster was carrying three Russian navigation satellites on the ill-fated mission that launched at 0238 GMT (10:38 p.m. EDT). Live video showed the Proton gyrating left and then right as it ascended off the pad before going horizontal, barrel rolling and falling into a nose dive. The front end of the rocket sheared away and the main stage erupted in a massive fireball before hitting the ground in a horrific explosion. The entire flight appeared to last a half-minute. Russian rockets do not carry self-destruct explosives like Western boosters, which prevented any attempt to destroy the wayward Proton before impact. A Russian Federal Space Agency statement said an emergency committee being created would be headed by Deputy Head of Roscosmos Alexander Lopatin. Standing 19-stories tall, the rocket weighed nearly 1.5 million pounds at launch, its first three stages loaded with unsymmetrical dimethylhydrazine and nitrogen tetroxide propellants and the upper stage filled with kerosene and liquid oxygen. The Proton is built by the Khrunichev State Research and Production and RSC Energia makes the Block DM upper stage. Six main engines ignite at liftoff to power the vehicle away from the launch pad and burns for two minutes. The second stage and its four engines fire through five-and-a-half minutes of the mission before the third stage and its single engine takes over. The upper stage then completes the necessary burns to shape the orbit for deployment of the spacecraft. Monday’s launch featured a three-stage Proton core vehicle topped with a Block DM upper stage to maneuver three GLONASS navigation satellites — Nos. 48, 49 and 50 — into their desired Earth orbit. The flight was carrying fresh craft for the space-based navigation constellation, which transmits positioning signals for military and civilian users. The satellites fly 12,000 miles above the planet in 64.8-degree inclination orbits. The system is similar in concept to the U.S. GPS network. It was 388th Proton rocket to launch since 1965 and the fifth this year, following a series of commercial missions. The program has suffered five failures in the past two-and-a-half years, mostly due to upper stage issues. Three other GLONASS satellites were lost in a botched launch in late 2010 due to a fuel miscalculation that prevented the vehicle from reaching orbit. The next launch, presumably grounded for the investigation, was slated for July 21 carrying the commercial ASTRA 2E broadcast satellite for Europe. Of course, this begs the question: why does all interesting/weird stuff always seem to happen in that part of the world? Stay well clear of anything going into the CBD between 16:00 and 21:00 tomorrow. 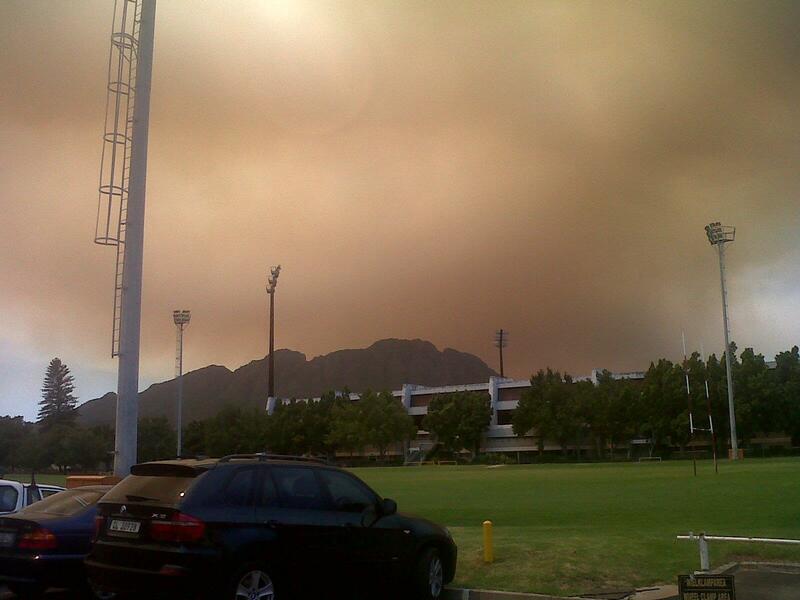 … because after I asked people yesterday not to set the next veld fire off, guess what happens? Tagged oh noes, we don't need no water let the mother****er burn, what's up with that? So, with the end of January fast approaching, the Cape Peninsula’s fire season is in full swing again. I posted last year on the havoc that a small uncontained fire on some open areas near the office park wreaked on the afternoon scrummage on the N2 leaving the CBD but, us city-dwellers have it comparatively good. The rural areas have it far worse. Case in point: the Hermanus/Stanford area (just over an hour’s drive away, unless you foolishly attempt it on a Friday afternoon when everyone going away for the weekend has the same general idea) had a massive blaze over the Christmas and New Year period that took six days to contain (and did significant damage to the Hermanus Yacht Club). The photos posted on the South African Weather Observation and Disaster Service blog pretty much say it all. Today, the mountains separating Stellenbosch from Franschhoek is Ground Zero. Megan (who I mentioned in one of my ancient posts here) took this photo earlier today from the University of Stellenbosch’s Danie Craven Stadium, and has been kind enough to let me reproduce it here. Once again, the photo tells the story. Yup, it can (and does!) get pretty bad around here. I was given a guided tour of one of the Stellenbosch wine farms around nine months ago, and I recall our tour guide mentioning that all of the area’s wine farmers have a genuine fear of blazes such as this. Not really surprising. Earlier this month, I mentioned the possibility of using our overly-awesome MyCiTi bus service to get to and from work. Since I wrote my earlier post, Cape Town recovered from the New Year’s hangover and turned the R27 into a massive car park, so in order to keep my sanity intact and transport expenses under control, using the bus service is fast becoming a necessity rather than a possibility. The only requirement for me to switch over is the commencement on operations on the Woodstock/Salt River feeder route. The implementation of new routes for the MyCiTi Bus Service, such as Walmer Estate and Salt River, is subject to the awarding of operating licences by the Western Cape Provincial Regulating Entity (PRE). These routes – along with the new smaller buses and newly constructed bus stops and stations, such as the Gardens Station – cannot become operational without these operating licences. The City of Cape Town respects due process, and from the beginning of the process the application, supported by the City have followed the legal and procedural requirements set down by the PRE at all times. The process began in August last year when operating licences for the new routes, which were then due to launch at the end of 2012 were submitted. The first hearing set by the PRE was for December 2012, but the PRE postponed the hearing to this week due to objections from concerned parties. The South African National Taxi Council (SANTACO) – on behalf of some taxi associations – and Golden Arrow Bus Services (GABS) lodged objections with the PRE. The hearing resumed this past Wednesday, January 16, 2013 at which time the PRE heard the applicants’ full application for the required operating licences. Before the City could provide its presentation in support of the issuing of the licences, GABS raised procedural objections, claiming to not have had sufficient time to prepare for the hearing. The hearing has now been delayed until the first week of February. The City is disappointed by these delays, and that this is holding back the implementation of our public transport service which aims to benefit all people in Cape Town. We believe the objections can be dealt with in a manner that does not prejudice and inconvenience the people of Cape Town. We trust that this will be the final delay, and that we will be able to activate our new routes and infrastructure soon, in order to bring the world-class MyCiTi bus service to an even greater number of awaiting residents and visitors. Of course, since I play a protection paladin myself, this interested me quite a bit (in terms of “wait… WHAT?!?!”). Key to this involves a bug with our Shield of the Righteous ability (our primary damage reduction ability), and how it interacts with Vengeance (a passive ability that increases our attack power based on unmitigated damage received). We’ve known about this for a while over on Maintankadin (and I’m guessing that Blizzard knew about it as well, but just never fixed it) — you can click on the link for all the details, but to summarise: due to a quirk of the Vengeance calculation and server/client latency, timing Shield of the Righteous with a melee swing from the boss could result in the Vengeance calculation grossly overestimating how much unmitigated damage we received, resulting in a massive spike of Vengeance, and hence attack power, and hence damage we do. Not only that, but many of our self-heals and absorbs also scale with attack power (Sacred Shield, I’m looking at you here — also Light’s Hammer and Execution Sentence, but since we only get those abilities at level 90, they’re not really applicable here), and one can see how our level 80 guy was not only able to deal enough damage, but also keep himself alive. But that’s only part of the story. Matt Walsh over on WoW Insider has filled us on the rest: there is some bind-on-equip rare gear found in the levelling zones of Mists of Pandaria (intended for players levelling from 85 to 90) that can, strangely enough, be equipped by a level 80 player. (Here’s an example.) By equipping those, our level 80 paladin managed to gain amounts of secondary stats (dodge/parry/mastery/haste/etc.) that were not originally intended for a level 80 player (when gear item levels were in the high 200s, not the low 400s in the case of the gear he had equipped). More importantly, because he was level 80, he was cleverly avoiding the combat rating drop-offs that occur at levels 81 and 86 (those levels coincide with players encountering Cataclysm and Mists of Pandaria content for the first time respectively). This resulted in absolutely crazy character stats: Matt mentions that our level 80 paladin had 95% haste and 88% mastery, which one simply wouldn’t see on a level 90 character. All of this came together to ensure our level 80 paladin could survive the raid bosses. The haste and attack power from Vengeance meant that Seal of Insight was regularly overhealing him, and Sacred Shield was fully absorbing his attacks (not only that, but the insane haste percentage meant that it was constantly refreshing as well). Plus, all of that mastery meant a damage reduction boost with Shield of the Righteous. In a nutshell, all of this was simply our player using Blizzard’s design choices, and creating unintended consequences out of them. Tagged mass breakage, oh noes, pure awesomeness, what's up with that?